When you’re considering which wine region in France to visit, you’re spoilt for choice! But perhaps top of the list should be Bordeaux! Bordeaux is the largest fine wine region on earth, with countries all around the globe importing more than 250 million bottles of Bordeaux wine each year. Over 60% of sales at fine wine auctions are Bordeaux wines. Wine lovers are spoilt for choice, with four separate fine wine areas (The Médoc, St Emilion, Graves and Sauternes) to explore. And with the Bordeaux being rated the best city on earth to visit by the Lonely Planet guide, you really couldn’t choose a better location for a wine-tasting holiday. And we have the best value wine tours in Bordeaux! A choice of day tours for just 70 euros a head! Meeting up with the founder of Chateau Cos D'Estournel in St Estephe! On our tours you will visit a magical place with everything from fairy-tale millionaire’s castles to down-to-earth family-run vineyards, and see the latest high-tech computerised wine-making equipment (which can scan every single grape!) as well as centuries-old techniques which have been passed down from generation to generation. For example, did you know that some chateaux still crack eggs by hand to get the egg white which is used to clarify their wine?! You’ll visit the vineyards, see the different grape varieties and learn how they’re cultivated. In the cellars you’ll learn how the wines are fermented, blended and matured and, finally, in the tasting room you’ll be able to sample and compare different vintages. And, perhaps most importantly, you’ll be able to ask questions, and get answers, in English! If you’d like to know why there’s so much fuss about Bordeaux wines, what makes this place so special for wine lovers, you’ll be able to indulge your curiosity. Our customers ask a thousand different questions, you might have one we’ve never heard before – ask away! Add in a delicious lunch in a typical French restaurant (or a picnic if the weather’s good) and, if you book with us, you’re in for a great day! For 2019 we're offering a great new range of English-language one-day tours, each including two vineyard visits. Bordeaux vineyards are getting greener and greener as they cut back on the chemicals used in the vineyards (the great first-growth Chateau Latour has just declared as being certified organic! ), and we're joining in by offering bike tours of the vineyards! The Medoc is a pretty flat area so cycling isn't too strenuous, however electric bikes can be arranged* for those wanting to take it really easy! All the tours are planned so that, if you're staying in Bordeaux, you'll have plenty of time for a leisurely breakfast and be back in time for an evening meal in the city. Singles welcome - meet up with fellow wine-lovers on our tours! * There is an additional charge for electric bikes. All the tours, visiting the big four appellations of the Medoc: St Estephe, St Julien, Pauillac and Margaux, are the same price: 70 euros a head (30 euros for under-18s). There is a 10% discount for groups of 4 or more. Visit fees and transport are included, lunch is either at a typical local French restaurant (at your cost) or when the weather is good, there is also an option including a picnic** – 85 euros a head (40 euros for under-18s). **Please specify at the time of booking if you would like the picnic option. If bad weather makes the picnic impossible, the extra picnic charge will be refunded on the day. Trains leave Bordeaux St Jean SNCF station at 1029 and arrive at Pauillac at 1135. There's plenty of free parking at Pauillac station if you're coming by car. *** If you have a group of 4+ we can also arrange tours on other days in low season. Just give us a call! Booking tours in advance is recommended as they can fill up quickly. However, we can often help at short notice, so do give us a call if you want a tour at the last minute! You can either pay in advance by credit or debit card or pay in cash on the day. You can either call us in England or in France (on the numbers shown on this page) or send us an email via the CONTACT US page and we'll get back to you. Touring the vineyards and sampling world-famous Bordeaux wines is one of the great pleasures of the region. 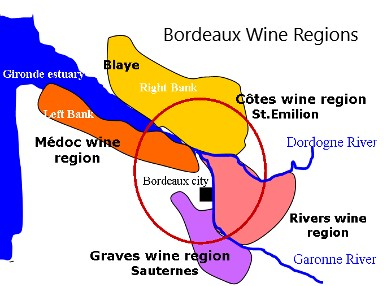 The Bordeaux wine region is a large (150 kilometres in diameter) area encircling the city of Bordeaux (see plan below). If you want to really taste your way around the best wine-producing districts, you should allow at least 4 days! If you're a confirmed claret lover, you'll want to visit and compare the wines of the great four communes of the Medoc, to the north of Bordeaux: St Estephe, St Julien, Pauillac and Margaux. Alternatively if you're looking to discover a wider range of wines, your 4 days would allow you to take in the classic reds of the Medoc to the north, and St Emilion/Pomerol to the south-east, the superb dry whites (and reds) of the Graves/Pessac Leognan area just to the south-west of the city and arguably the world's greatest sweet white wines in the Sauternes/Barsac area to the south. If you are driving, you will see “Route des Vins” signage in most of the major wine areas to guide you and many chateaux offering a degustation gratuite (free tasting) to tempt you. Most chateaux have English-speaking tours by appointment only, and, if the tasting is free, you will be expected to buy something. Most of the big wine-producing towns have a Maison du Vin, a kind of tourist office, where you can find useful information about the chateaux you can visit (many chateaux will not be open during low season and at weekends and bank holidays). The most famous chateaux are almost exclusively by appointment only. We recommend that you take advantage of local knowledge and contacts and book for one or more days' guided tours. Would you like to discover the St Emilion that most tourists miss? Climb the King's Tower or the Church Bell Tower for the most awesome views, visit the cloisters, visit the magnificent underground caves of a grand cru classé. Taste a magnificent grand cru classé direct from the barrel. 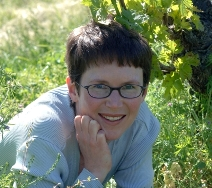 Learn about the appellation system and about St Emilion from an insider (Caro is a winemaker and member of a commune appellation in Aquitaine). Visit and taste the wines of two grand cru classé vineyards in St Emilion. Visit the village of St Emilion. 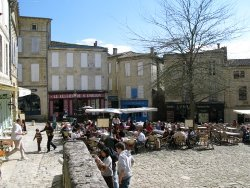 Enjoy a wonderful lunch in St Emilion. 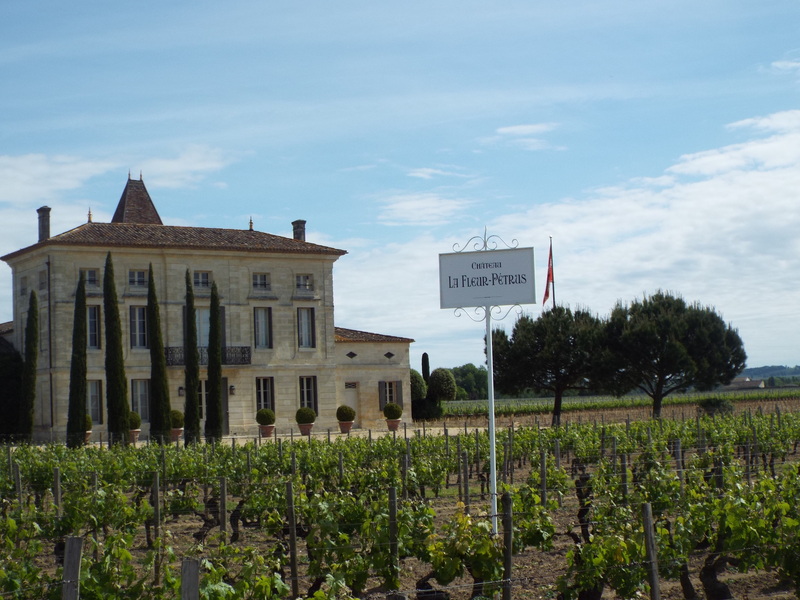 Learn about the great wines of St Emilion and see the landmark properties. 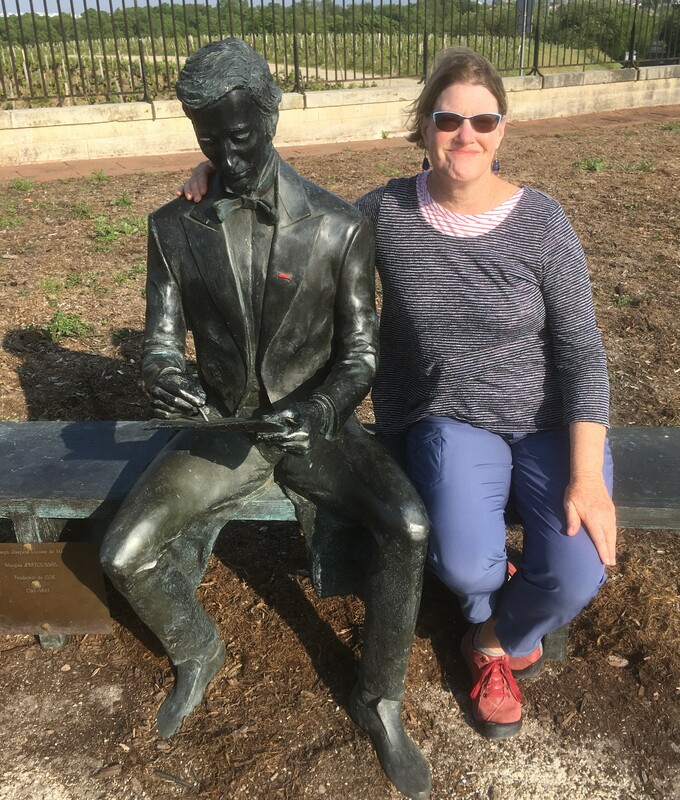 Caroline Feely offers a St Emilion Wine Tour Adventure for €240 per person including lunch on the main square in St Emilion (minimum two people). This tour is available all year round. Reservation required.